(Nanowerk News) A solar cell that produces fuel rather than electricity. Researchers at Eindhoven University of Technology (TU/e) and FOM Foundation today present a very promising prototype of this in the journal Nature Communications ("Efficient water reduction with gallium phosphide nanowires"). The material gallium phosphide enables their solar cell to produce the clean fuel hydrogen gas from liquid water. 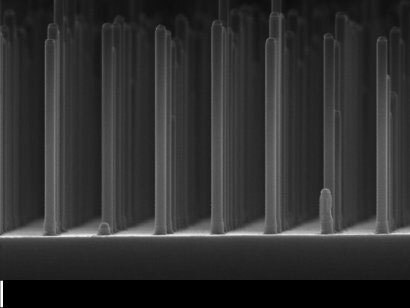 Processing the gallium phosphide in the form of very small nanowires is novel and helps to boost the yield by a factor of ten. And does so using ten thousand times less precious material. The electricity produced by a solar cell can be used to set off chemical reactions. If this generates a fuel, then one speaks of solar fuels - a hugely promising replacement for polluting fuels. One of the possibilities is to split liquid water using the electricity that is generated (electrolysis). Among oxygen, this produces hydrogen gas that can be used as a clean fuel in the chemical industry or combusted in fuel cells - in cars for example - to drive engines. To connect an existing silicon solar cell to a battery that splits the water may well be an efficient solution now but it is a very expensive one. Many researchers are therefore targeting their search at a semiconductor material that is able to both convert sunlight into an electrical charge and split the water, all in one; a kind of 'solar fuel cell'. Researchers at TU/e and FOM see their dream candidate in gallium phosphide (GaP), a compound of gallium and phosphide that also serves as the basis for specific colored leds. GaP has good electrical properties but the drawback that it cannot easily absorb light when it is a large flat surface as used in GaP solar cells. The researchers have overcome this problem by making a grid of very small GaP nanowires, measuring five hundred nanometers (a millionth of a millimeter) long and ninety nanometers thick. This immediately boosted the yield of hydrogen by a factor of ten to 2.9 percent. A record for GaP cells, even though this is still some way off the fifteen percent achieved by silicon cells coupled to a battery. According to Bakkers, it's not simply about the yield - where there is still a lot of scope for improvement he points out: "For the nanowires we needed ten thousand less precious GaP material than in cells with a flat surface. That makes these kinds of cells potentially a great deal cheaper," Bakkers says. "In addition, GaP is also able to extract oxygen from the water - so you then actually have a fuel cell in which you can temporarily store your solar energy. In short, for a solar fuels future we cannot ignore gallium phosphide any longer."